mOmega3™ are patented Omega3 fatty acids fractions extracted in a delicate manner from fish skin. Omega3 fatty acids are known to promote health and are an essential part of the skin’s morphology. The mOmega3™ extraction technology has been especially developed to preserve the fatty acids ability to maintain moisture in the outermost layer of the skin. Omega3 fatty acids are essential fatty acids that the human body is not able to synthesize and thus need to be obtained from outside sources. The most significant building component of skin is collagen. mCollagen™ are collagen particles extracted from fish skin using a patented technology. The particles form a protective layer across sensitive skin, filling up small wrinkles and damaged areas. The outermost layer of the skin consists of 15 to 20 cell layers of dead cells that have dried out and died. This is the corneal layer of the skin. Between the dried cells is the inter cellular substance, which is rich in fatty acids that keep the structure intact and watertight. Figure 1 – The corneal layer of the skin. 1. Dried out cells, 2. intercellular lipids. 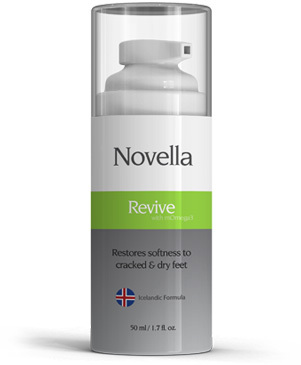 Novella Revive formula has been specially formulated to remove dead skin from the feet and hydrate remaining skin to prevent build up of dead skin (calluses) again. In the case of extreme skin dryness, the corneal layer of the skin loses the fatty acids and dries out and no longer protects the living cells below. ammation causing itching as well as the formation of callus that can become cracked and painful.